Since 2011, the teaching of reading has taken center stage in Rwanda. Something remarkable has happened in Efrance Uwamarayika’s first grade classroom at Gatonde Primary School—every child has books of his or her own. It’s a sight she doesn’t take for granted. For a long time, her classroom had no books. “Children only used to read what I wrote on the chalkboard,” says Uwamarayika. As the classroom’s single chalkboard was used for multiple subjects throughout the day, reading time ended as soon as she had to erase the board and move onto another subject. For nearly two decades, Rwandan teachers like Uwamarayika have struggled with a lack of essential classroom resources, just one of a number of complexities stemming from the hostilities and genocide carried out in the country in the 1990s. But since 2011, EDC has been helping to write a new chapter in Rwanda’s history. Partnering with the country’s Ministry of Education (MINEDUC), EDC’s USAID-funded Literacy, Language, and Learning (L3) Initiative has improved almost every aspect of teaching and learning in schools across the country. The results? New national literacy standards are in place. Teachers are receiving professional development. Community libraries have been established. People of all ages take part in a countrywide writing competition. 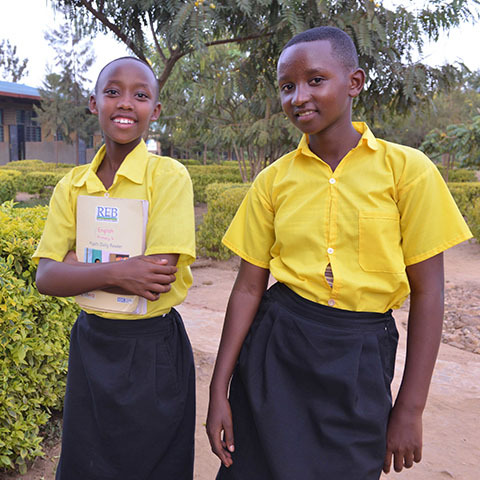 And reading materials, developed by EDC and the Rwandan Education Board (REB) in both English and Kinyarwanda, have been made available to every student in the country. To Uwamarayika, these changes have been transformative. Teachers only need a cell phone and a portable speaker, provided by L3, to play interactive audio instruction lessons in their classrooms. 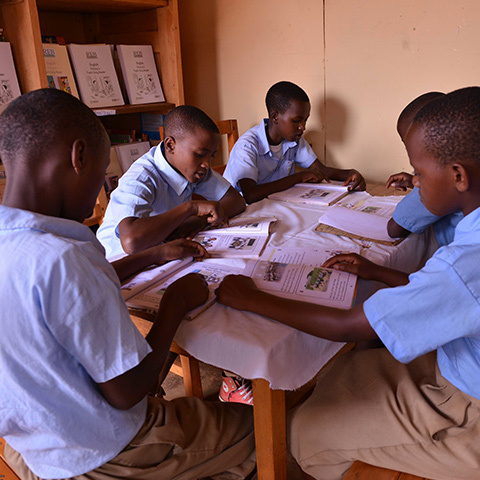 A 2011 USAID-funded reading assessment revealed the scope of Rwanda’s literacy challenge. At the beginning of the academic year, 13 percent of fourth-grade students could not read a single word in Kinyarwanda—their mother tongue—despite three years of instruction. And in sixth grade, only one-third of students were reading with fluency. 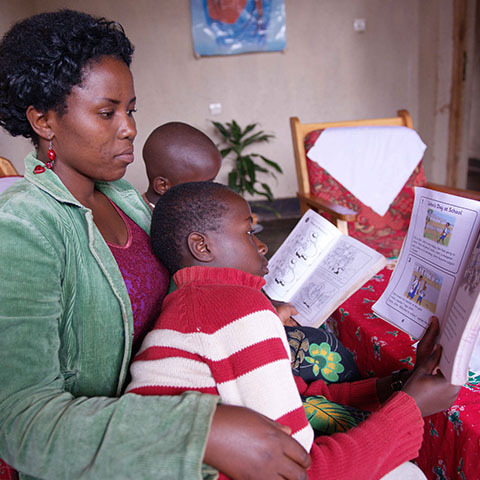 One book at a time, a culture of reading is taking root throughout Rwanda. 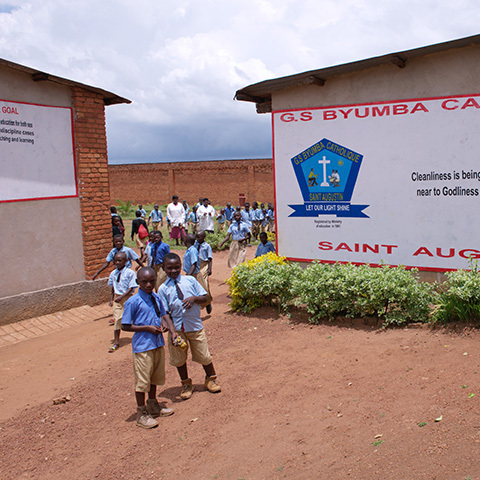 Byumba Catholic is one of more than 2,000 primary schools in Rwanda that has received literacy materials from the L3 initiative. Books, words, and letters surround students at Byumba Catholic school. Reading as a family activity is gaining popularity. Here, Musabyemariya Flora reads with her two sons. High rates of illiteracy were unacceptable. Education is one of the pillars supporting Vision 2020—Rwanda’s long-term plan for constructing a democratic, middle-income country. Interactive audio-based lessons, developed by L3 and distributed via mobile phone, provided teachers with new ways to teach reading and writing. Instead of having students memorize lists of sight words, teachers now guide students through lessons where they decode words using phonics and phonemes. Students read a variety of fictional and informational texts and are writing more than ever before. Images from “Zet and the Net,” a story included in the Primary 2 reader. 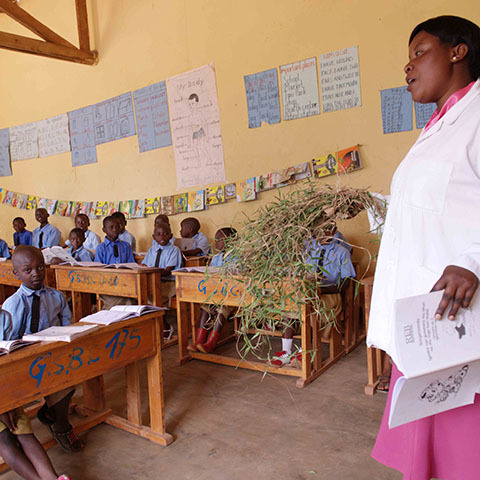 After hostilities ended in 1995, many of Rwanda’s pre-war classroom textbooks were discarded. Replacement books were slow in coming, leaving schools devoid of basic reading materials. A team of writers, working with the REB, developed readers for students in grades 1–4 that aligned with the country’s new literacy standards, and the REB then approved, printed, and distributed the books. The books are written in both Kinyarwanda and English, the language of instruction beginning in grade 4. Early data are showing that this approach is working. An EDC report also showed that students in grades 1, 2, and 3 are reading more words per minute in Kinyarwanda than they were only a year ago. There have also been small gains in students’ reading comprehension skills. But something else is happening, too—students are more engaged and confident learners across all subjects. “Children have become active in the learning process,” says Jean Baptiste Nsanzumuhire, a third-grade teacher at Rukore Primary School. Gone are the days, he says, of students just reciting after the teacher. Despite all the progress that has been made since 2011, many Rwandans still remember a time before children had books, before their country had built a culture of reading. Sugrue does, too. She recalls a recent trip to Rwanda, where she saw a young girl sitting by the side of the road, engrossed in a book.